You must have heard of National Security Agency (NSA) by now through internet or newspapers. It is premier security Agency of the United States of America which gathers information by monitoring emails, Facebook, Google Plus and everything that belongs to web and is deemed as having a bearing on security of the US. It details all the features and accomplishments of the Agency over the years. However a 'parodier' who is an expert in making of parody sites has created a separate site which you can visit here. General Janet Alexander - Head of the Domestic Surveillance Directorate: "We are often asked, "What's more important - civil liberties or National Security?" It's a false question; it's a false choice. At the end of the day, there are no civil liberties without National Security. Not only are we entrusted to protect and defend the Nation, but as the Domestic Surveillance Directorate and as citizens, we must do our part to 'Secure the Blessings of Liberty to ourselves and our Posterity'. This is our commitment." The site’s creator, who wishes to remain anonymous, is a master aggregator and has gone to lengths to find data into the funding spreadsheets to surface the codename for the NSA data center in Utah: Bumblehive. He also runs a White House parody site also among others. Since its launch it has had over 95,000 visitors, including a few from the NSA according to his site analytics. It’s also fooled a few people, as parody sites do, who were surprised by the agency’s candor. 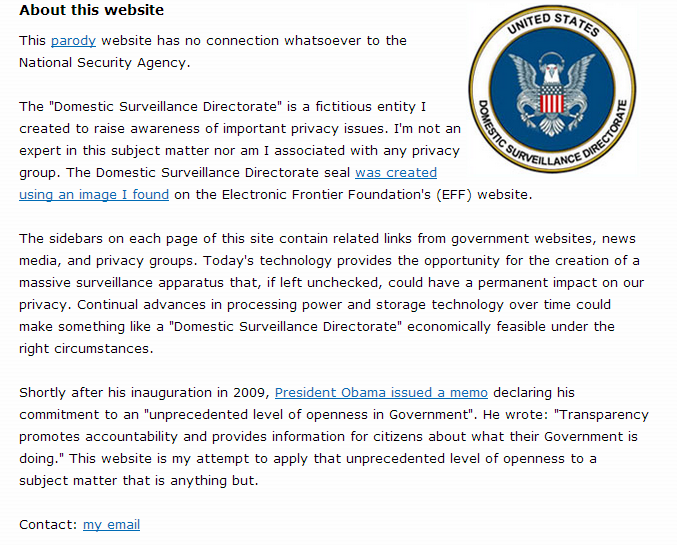 This is a must visit site if you are anti PRISM or anti NSA for the acts of privacy invasion they are carrying out. I am not giving more images as it may hurt the webmasters just cause.